Loving pearls as I do, there has to be an overlooked variety in my collection, and that is the akoya. Akoyas are the original Japanese saltwater pearl selected for culturing a hundred years ago by William Saville-Kent and successfully developed in the early 1900s by the Japanese innovator Kokichi Mikimoto. They are now also grown anywhere pearls are cultured: China, South Korea, Vietnam and Australia. While wedding whites prevail, akoyas also occur naturally as cream and pale or blue-grey. Black and other coloured akoyas are dyed; always inquire if greys or blues are dyed. Chances are, if you have a strand of 6-8 mm classic matched or graduated pearls that belonged to your mother or aunt, they are akoyas. Fine-quality akoyas have a sharp, mirror-like luster–you can see your reflection. Whites are sold in pink or silver overtones (which result from industry-accepted treatment that is rarely disclosed, such as bleaching, buffing and "pinking", which is just what you'd think). A strand of the fine akoyas are like Carole Bouquet: beauty lent by both surface perfection and underlying mystery. 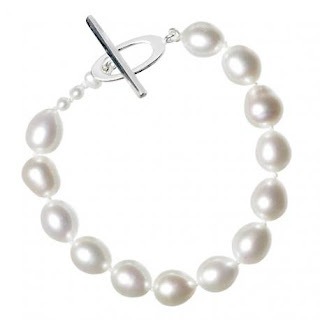 "Akoya pearls are on average larger, smoother, rounder, and more lustrous than Freshwater pearls." Complete oysterpoop! 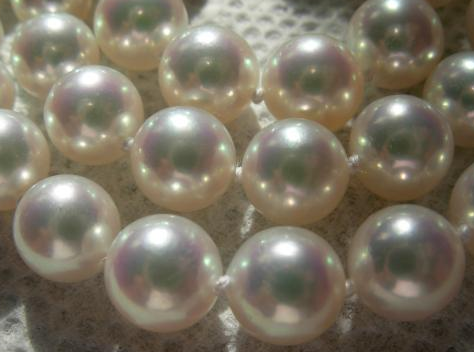 "Larger, smoother, rounder" are all qualities of any pearl (and pearls are graded on these qualities). Akoyas are in fact typically smaller than both South Sea varieties and the sizeable Chinese freshwaters harvested today. What they do have is spectacular lustre in the higher end grades. 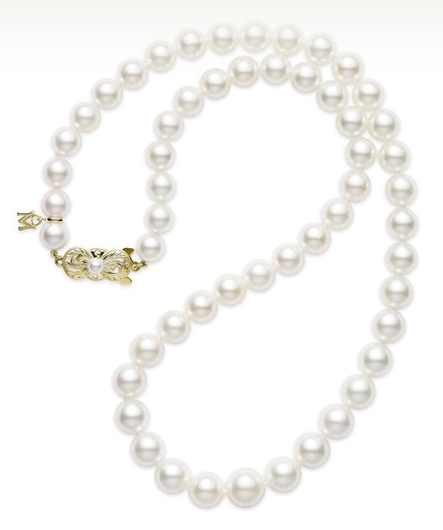 The hanadama designation is special certification for akoyas, indicating the finest pearls from any given harvest. (There can be some variation in visible quality within that designation.) 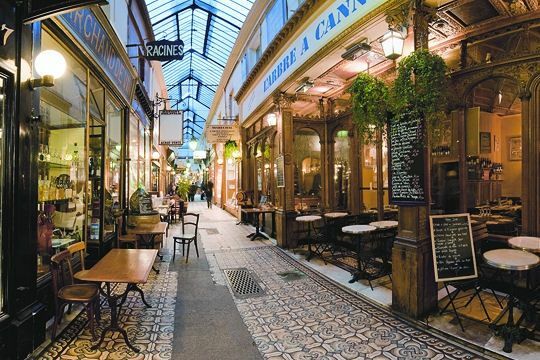 They will deliver that headlight effect, so even a smaller strand can be seen across a room. But again, the finest CFWPs can give AAA akoyas a very good run. Here's a photo provided by pearl guru Jeremy Shepherd of Pearl Paradise; can you tell which are the Hanadama Akoyas and which are his Freshadamas, the finest grade of CFWPs)? Which are the akoyas, which are the CFWs? Akoyas are costly; the 7-9mm Mikimoto strand shown is $3,500 and is not their top (AAA) level, which is triple that price, at least. (Mikimoto, like other status brands, have been appealing to a broader market by offering several lines.) At one of my pearl grading courses, a jeweler was crowing about how she was able to markup lower-grade Mikimoto akoyas, reaping a big profit from unsuspecting customers "who just wanted that M", the logo charm at the clasp. For my money, I'd buy a quality Chinese freshwater pearl, like the Freshadamas sold by Pearl Paradise. CFWPS will have much thicker nacre, so will sustain their gorgeousness provided you treat them nicely. Pearl Paradise's 8.5-9mm white CFWP Freshadama strand is $1,150, while the serene but less lustrous 9.5-10.5mm CFWP strand shown above is about $625. Their 9-9.5mm akoya hamadana strand is $7,800, and even on a monitor you can see the intense, sharp luster. For any pearl, but especially akoyas, which can be rushed to market with very thin nacre, rotate and look at each pearl, checking for visible banded "moonstone" effect on the surface. These pearls, called "blinkers", are unacceptable. As Jessica Rabbit famously said, "I'm not bad, I'm just drawn that way", and that's the problem with akoyas: their polite facade suggests wedding gowns and preppy twinsets. It's hard to find anything but the most traditional styles in akoyas; the hip designers head for freshwaters, drawn by the array of natural colours and lower cost. A shimmering akoya, though, as a solitaire necklace, would please a woman whose taste is for the simple and beautiful. The one shown is $170 from Premium Pearl, a seller I trust. It's 8.9-9mm AAA quality on a 16-inch gold chain, so makes a classic, chic accessory. 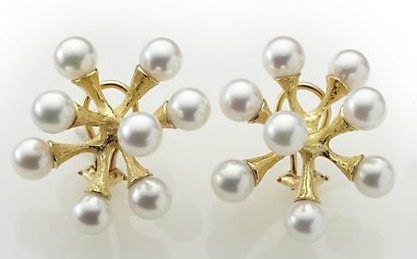 John Iverson's akoya "Jacks" earrings show the refinement of akoyas to advantage; $5,250 at Gump's. And akoyas also appear as keshis. (If keshis are new to you, see this post.) Here's a a 35-inch akoya keshi necklace punctuated with yummy 9-10mm white South Sea baroques, $479 at Pearl Pardise. 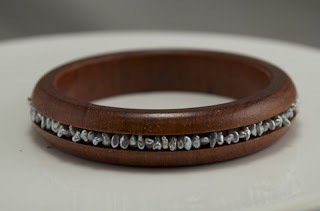 At Kojima Company, a bracelet made for a woman who wears her pearls with tees as well as dresses: grey akoya keshis set in rosewood. (I'd have bought it if the wrist size were larger.) Price, $108. When someone says "pearls are boring", I assume they are thinking of a demure strand of 7mm akoyas, perhaps with one of those granny filagree clasps. 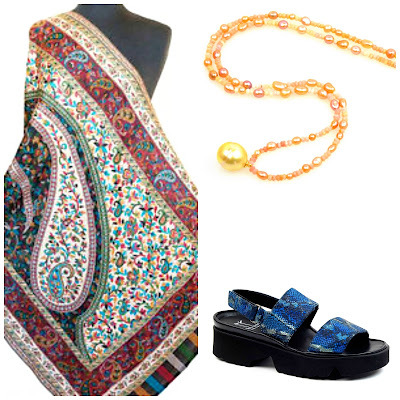 But they are the cultured pearl that moved the gem from dowager's jewel boxes to the necks of countless women. While freshwaters have largely trumped them for value and durability, if you have a strand, you might remodel them into a version of Kate Hines' white pearl bracelet, giving your akoyas a new life. *clutching her 8mm Akoyas* Heavens! I got the game wrong! And that wood bracelet is brilliant. Why is reading about pearls so soothing? Thumbs up. Always informative...I shall wear a few strands in your honour today Duchesse! Love your pearl posts -- I didn't realize you had had professional training. It shows. I've got my lavender studs on today! LPC: Game wrong? Hardly! Reading about pearls connects us to the natural beauty of the world, a beauty we can wear easily. How's that for a rationale? sisty: I'm not a jeweler, I just like to hang out with them. The GIA open their extension courses to anyone. The wood bracelet is just too cool. I love pearls and have a couple of inexpensive strands. I have a strand that belonged to my Mother, but at 16" they are just too tight around my neck. Thank you so much for sharing this wonderful information with us. Pseu; Sure! BTW the last e-mail addy I have for you seems to have changed. Pls e-mail me using my blog addy and we can confer- fun! 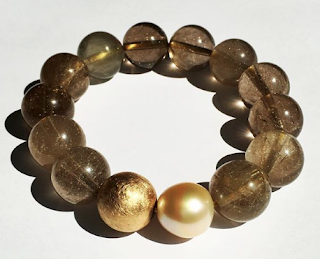 Debbi: I have written some pearl rehab posts (they are under the label "pearls" om the right menu) and in summary, your akoyas could make a beautiful 2-strand bracelet or be mixed with other pearls, stones or beads to find new life while still retaining their deep sentiment for you. Sigh, pearls. I love your pearl posts. I love seeing Akoyas on other women, but when I am shopping for pearls, I seem to find I am more drawn to CFWPs, there is something about the way they glow I find more soothing than Akoyas. Of course, it is possible that someday I will meet an Akoya strand that makes me change my mind.